I was contacted a short while ago by Sue Glass who is the quilt show chair for the 2015 and 2016 South Bay Quilters Guild of Torrance California. 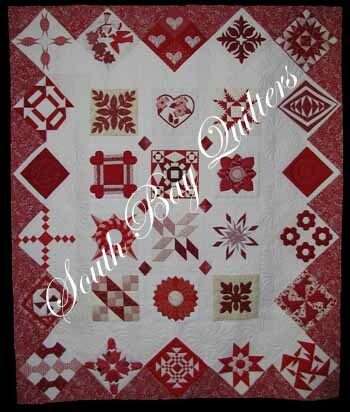 For their 2015 show, the challenge was 12 ½ inch red and white blocks, and one of those submitted used my block “Patrice’s Gift” from the Quiltmaker 100 blocks magazine. Since then they decided to use those challenge blocks to make their 2016 opportunity quilt, which is really lovely (red and white of course). 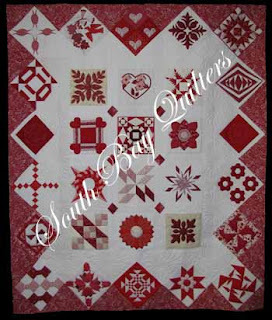 The quilt will travel around the Southern California area and be displayed at their quilt show. I just had to share the photo. Isn't it a beautiful quilt. Patrisse's Gift is the second block from the top on the right hand side, just below the 's' in quilters. What an honour. Collection 34 - Where Did That Name Come From?